There is nothing racist about upholding the 14th Amendment right to due process under the law. The tragic Michael Brown shooting this summer in Ferguson, Missouri has led to shocking calls for denial of due process to Darren Wilson, the police officer involved. The African-American community in Ferguson may have legitimate grievances with aspects of their local government, including their representation on the local police force. However, the calls for Wilson’s immediate conviction appear to be motivated by simple ignorance of the legal system. As the quote makes clear, due process rights should be respected as a source of protection against racism in law enforcement and the prosecution of crimes. Citizens should also be aware that they have a due process right to record the police; those engaged in acts of protest or civil disobedience would be wise to do so in order to defend themselves against false accusations. 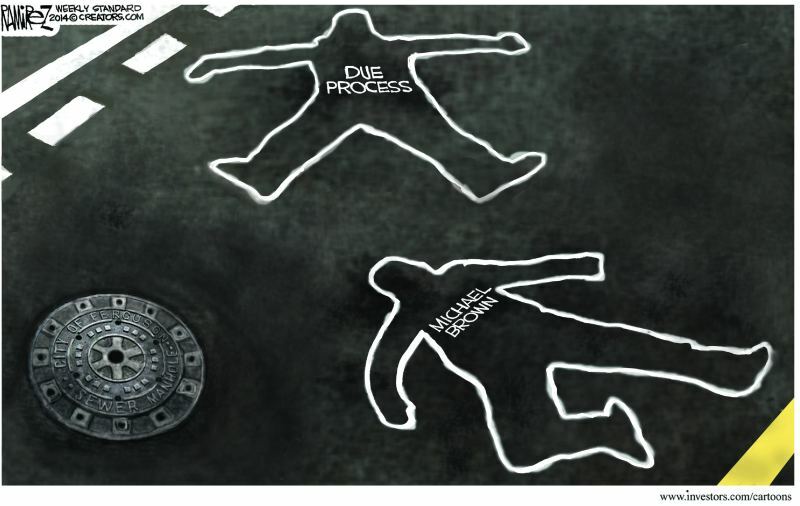 Some would argue, of course, that Michael Brown himself was denied due process in his altercation with Officer Wilson, but that unproven assertion does not trump Wilson’s right to due process. Alan Dershowitz bemoans the lack of video evidence in the Brown shooting, but he staunchly defends Officer Wilson’s due process right. It is too easy to vilify those accused or suspected of the most serious and despicable offenses; that is why due process must be respected, even if the system isn’t free of errors. Of course, even accused murderers and rapists are entitled to due process. In the end, the verdicts that come out of the system must be respected, or there is no hope of moving closer to perfect justice. Let us hope that is remembered when the grand jury ends its deliberations over whether to charge Darren Wilson in the Brown shooting, no matter the verdict.